Feb 2017 provided me an opportunity to visit this serene Divyadesam nearer Thiruvarangam ~ the “Kovil” – for all Sri Vaishnavaites. The Chola King Karikala has a rich legend and anecdotal significance in Sangam literature. The Kallanai [literally one made of huge stones] ~ the Grand Anicut, is an ancient dam built on the Kaveri River. It is located about 20 km from Tiruchirapalli. Reported to have been built around 2ndCentury by the Chozha king, it stands as a proud exhibit as Chola engineering skills. The purpose of the Kallanai was to divert the waters of the Kaveri across the fertile delta region for irrigation via canals. Certainly much water has flown under the dam built as a barrier using unhewn stones by the King who is praised to have irrigated 69000 acres of land – the British in later period changed its structure and it looks much different now, sadly not much of water flowing due to conflict with the neighbour. இனியன அமுது செய்விக்கையில் சிறந்தது ஆக உரைப்பது "அப்பம்" எனும் பிரசாதம். Appam [Neyyappam] is a delicacy - it is a rice pancakes fried in ghee. A batter of pouring consistency is made of rice flour and jaggery. Cardamom and dried ginger are added for flavour. There is a legend associating the temple with this prasadam. There are many ways of reaching this Divyadesam ~ from Thiruvaiyaru ~ from Thiru Anbil and from Srirangam via the famous Grand Anicut. 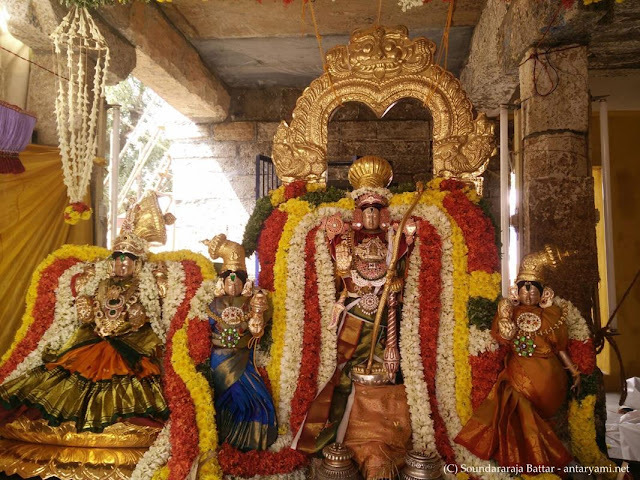 In one way of grouping significant temples there is the ‘Pancharanga Kshetrams’ five sacred temples dedicated to Lord Ranganatha situate on the banks of the Kaveri River. Srirangapatnam is called the Adi Ranga [could be in the order of its location in the route of Kaveri and not to be the oldest or in antiquity]; the great Thiruvarangam; Sri Parimala Ranganatha Perumal Temple [Thiru Inthalur / Mayavaram / Mayiladuthurai] ; Sri Sarangapani temple at Kumbakonam and this one on the banks of kaveri variously known as ‘Koviladi / Appakudathan’ and in divyaprabantham denoted as “Thirupper Nagar”. a view of Gopuram taken in 2008 by me. The Moolavar of this Sthalam is Appakkudathaan. He is also called as "Appalaa Ranganathan". Prathyaksham for Ubamannyu and Parasarar(Bhattar). Moolavar in Kidantha Kolam [reclining posture] and in bhujanga sayanam facing west direction. 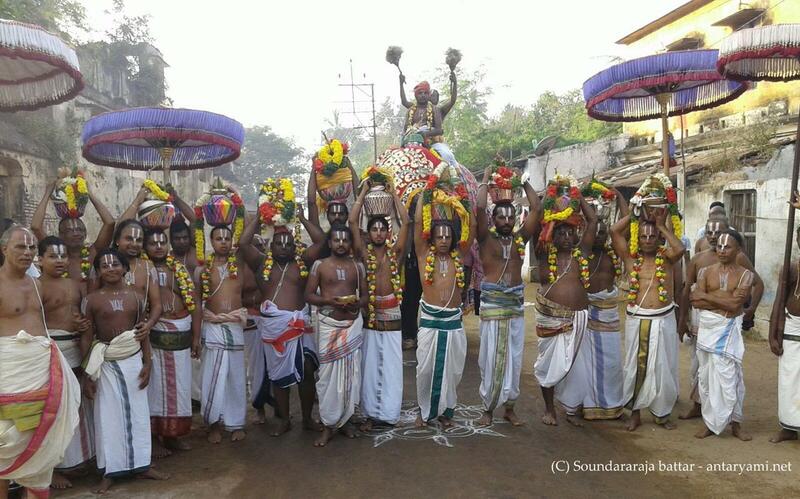 Thayar is “Kamalavalli Nachiyar” – the sannathi also situate on the elevated portion.. The temple itself is built on an elevated structure and approached through a fleet of steps. 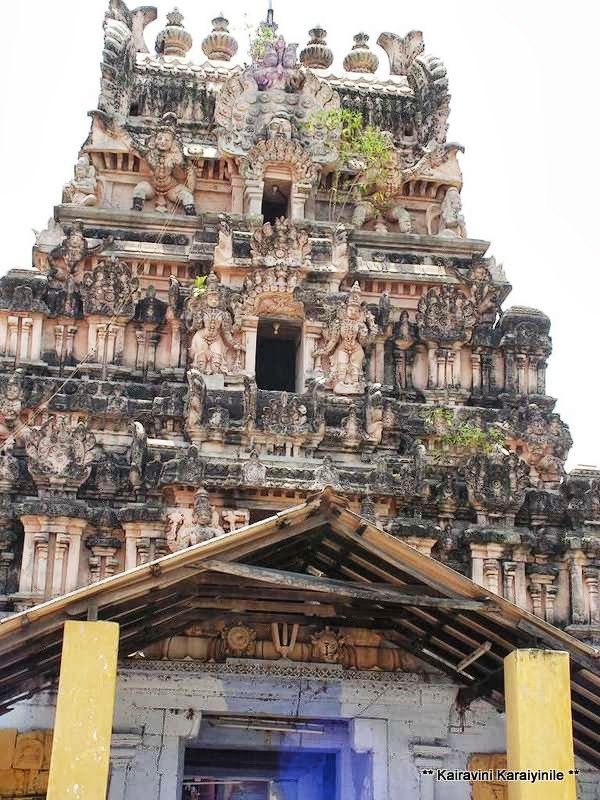 The Rajagopuram (the main gateway) has three tiers and the temple has a precinct around the sanctum. From the times of the King fulfilling His wish and earning the blessing, the Lord here is offered ‘Nei appam’ everyday and popularly called “Appakudathan”…. The pot to contain the prasadam is near the hand of the Lord in reclining posture [and not being held in hand as described in some books]. It is stated that the temple has inscriptions from the 18th year of the regime of Aditya Chola. The temple is considered as the mukthi stalam [providing salvation]. Sri Periyazhwar, Thirumangai Azhwar, Thirumazhi alwar and Swami Nammalwar have sung praising the Lord at this divyadesam. The Sanathana Krishnar idol here is believed as preceptor of boon to those who seek to have progeny. திருக்கையிலே திருவாழி திருச்சங்கையுடையவனும்; காளமேகம் போன்ற திருநிறத்தை உடையவனும்; பொய் என்பதே அறியாத மெய்யனும்; தனது திருவடிகளிலே பணிவர்களை, நித்ய கைங்கரிய நிஷ்டராக ஆக்கிக் கொள்பவனும் ~ ஆன பெருமான் திருவனந்தாழ்வானைப் படுக்கையாக கொண்டு உறையும் திவ்யதேசங்களில் முக்கியமானது திருவரங்கத்துக்கு அருகிலேயே உள்ள "கோவிலடி ~ அப்பக்குடத்தான் எனும் "திருப்பேர்நகர்" திவ்யதேசம். மலர்ந்த தாமரைகளை உடைய நீர்நிலையும் அடர்ந்த சோலைகளையும் உடைய திருப்பேர்நகரானது திவ்யநாமத்தை உச்சரிக்கும் நம் அனைவருக்கும் எல்லா வளங்களும் கிட்டும் என திருமங்கைமன்னன் அறுதி இட்டு உரைக்கிறார். In the year of Sri Ramanuja Sahasrabdi, very happy in placing couple of photos of our great Acharyar Swami Bhagavath Ramanujar and alongside our Thennacharya Mamuni – Sri Manavala Mamunigal as giving darshan at Thiruppernagar. arulappadu Sadagopar, Kaliyan, num Udayavar.. .. ..
Sri Andal ~ Sri Krishnar - Nithyaberar. Azhwar Emperumanar Jeeyar Thiruvadigale Saranam. PS : Kallanai is around 15 km from Trichy and the temple is less than 5 km from the Grand Anicut.